Breaking the Vatican tradition, during a secret conclave of cardinals, he decided not to live in the apostolic apartments. The pope, is the Bishop of Rome and the ex officio leader of the worldwide Catholic Church. Since 1929, the pope has also been head of state of Vatican City, a city-state enclaved within Rome, Italy. The Vatican City State is universally recognised under the international law as a sovereign State, distinct from the Holy See - the office of the Pope. The Vatican’s history as the seat of the Catholic Church began with the construction of a basilica over St. Peter’s grave in Rome in the 4th century AD. The area developed into a popular pilgrimage site and commercial district. In 1309, it was abandoned following the move of the papal court to France. However, the Church returned in 1377 and famous landmarks such the Apostolic Palace, the Sistine Chapel and the new St. Peter’s Basilica were erected within the city limits. 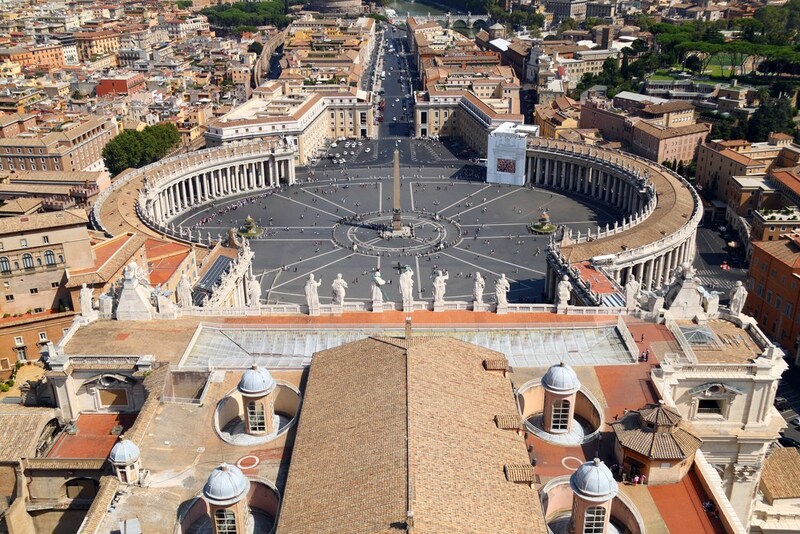 Vatican City was established in its current form as a sovereign nation with the signing of the Lateran Pacts in 1929. 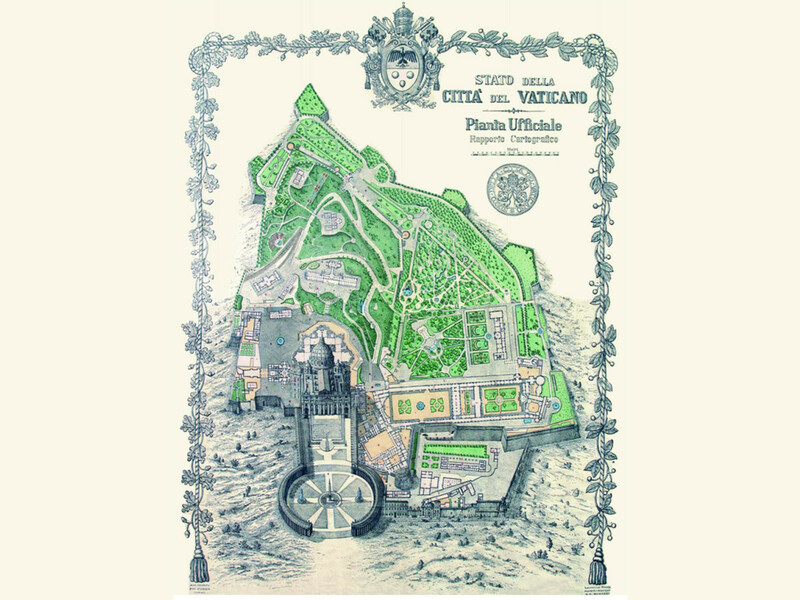 The term ‘Vatican’ was used in ancient times to identify the marshy area on the right bank of the Tiber River, between the Milvio Bridge and the present Sixtus Bridge. During the monarchy and the republican age, the area was known as Ager Vaticanus. During the early years of the Roman Empire, it became an administrative region populated by villas, as well as a circus built in the gardens of Emperor Caligula’s mother, to let the charioteers train. It was later restored by Emperor Nero who reigned from 54 to 68 AD. Tradition has it that Peter suffered martyrdom there in the great Christian persecution ordered by Nero in 64 AD. 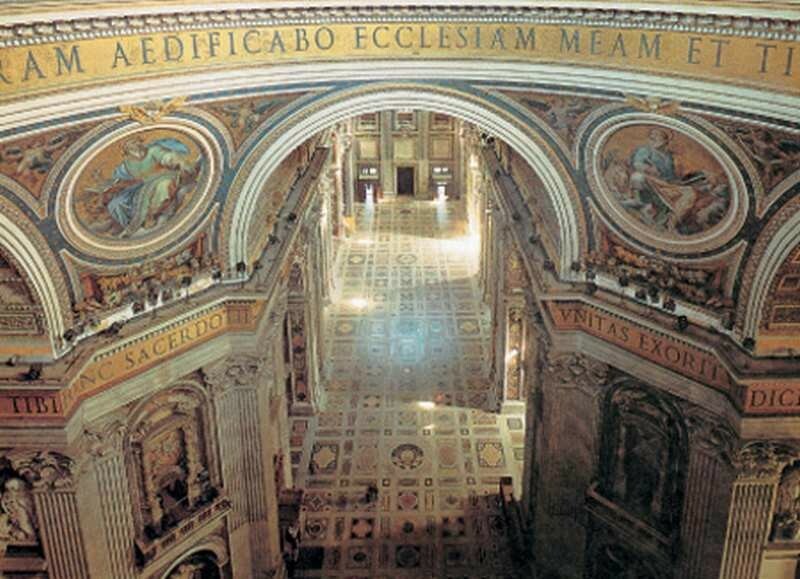 In 313, after embracing Christianity, Emperor Constantine I, with the Edict of Milan, began constructing a basilica over St. Peter’s tomb in 324. Originally, the word ‘basilica’ was used to refer to an ancient Roman public building, where courts were held. It also served as a meeting place for administration, as a law court, and as a marketplace. St. Peter’s Basilica soon became a spiritual center for Christian pilgrims. This led to the development of housing for clergymen and a marketplace that became the thriving commercial district of Borgo. In 846, an attack by pirates damaged St. Peter’s. Pope Leo IV ordered the construction of a wall to protect the holy basilica and its associated precincts. The 39-foot-tall wall was completed in 852 and enclosed the Leonine City, an area covering the current Vatican territory and the Borgo district. The walls were continually expanded and modified until the reign of Pope Urban VIII in the 1640s. Although the pontiff traditionally lived at the nearby Lateran Palace, Pope Symmachus built a residence adjacent to St. Peter’s in the early 6th century. It was expanded hundreds of years later by both Eugene III and Innocent III. In 1277, a half-mile-long covered passageway was assembled to link the structure to Castel Sant’Angelo. In 1309, the papal court was shifted to Avignon, France. Rome and St Peter’s were abandoned for over a century. Although the popes returned to Rome in 1377, another fifty years passed before the city regained its former lustre. The possibility of completely rebuilding St Peter’s was first broached in the mid-15th century. Pope Nicholas V (1447-1455) had the architect Bernardo Rossellino draw up plans for enlarging the Basilica, adding on an apse more prominent than the Constantinian one. The project had to be abandoned a few years later when the Turks started to advance and Constantinople fell. Between 1477 and 1480 Pope Sixtus IV (1471-1492) started building a great chapel, named “Sistina” or the Sistine Chapel after him. It was decorated with frescoes painted by the then leading Renaissance artists like Botticelli and Perugino. It was inaugurated on 15th August 1483. Significant changes to the city took place after Julius II became pope in 1503. He started to pull down the Constantinian basilica, began work on the new Saint Peter’s, and built the famous Belvedere Courtyard. 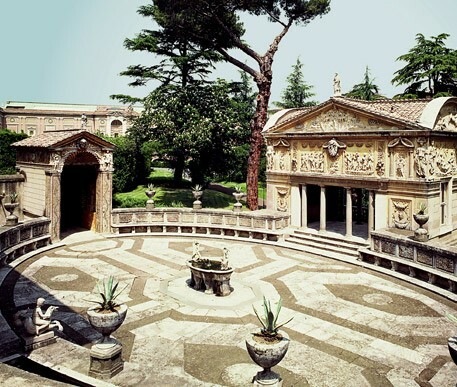 His intention was to connect the small Palace of Belvedere, which was constructed by his predecessor Innocent VIII (1484-1492) and which stood to the north of the courtyard, with the cluster of medieval buildings to the south. Pope Julius also summoned Raphael and Michelangelo to Rome, asking them, respectively, to fresco the papal apartments and the Sistine Chapel. Work continued throughout the century. After various initial difficulties were overcome, the Basilica of Saint Peter was planned and built by Michelangelo (mid-16th century). Measuring 452 feet tall and encompassing 5.7 acres, the new St. Peter’s stood as the world’s biggest church until the completion of the Ivory Coast’s Basilica of Our Lady of Peace of Yamoussoukro in 1989. In 1984, the Vatican City was declared by the United Nations Educational, Scientific and Cultoral organisation (Unesco) as a World Heritage Site under the Cultural category. Traditionally, the Apostolic Palace is the official residence of the reigning pope. However, Pope Francis chose not to live in the official papal residence in the Apostolic Palace, but to remain in the Vatican guest house, in a suite in which he can receive visitors and hold meetings. He is the first pope since Pope Pius X to live outside the papal apartments. Also referred to as the Vatican Palace, the Papal Palace, the Sacred Palace and also the Palace of the Vatican, it is located North-East of St. Peter’s Basilica and next to the Bastion of Nicholas V and the Palace of Gregory XIII. The construction of the current Apostolic Palace started on the 30th of April 1589 during the reign of Pope Sixtus V and it was completed by his successors Pope Urban VII, Pope Innocent XI and Pope Clement VIII. 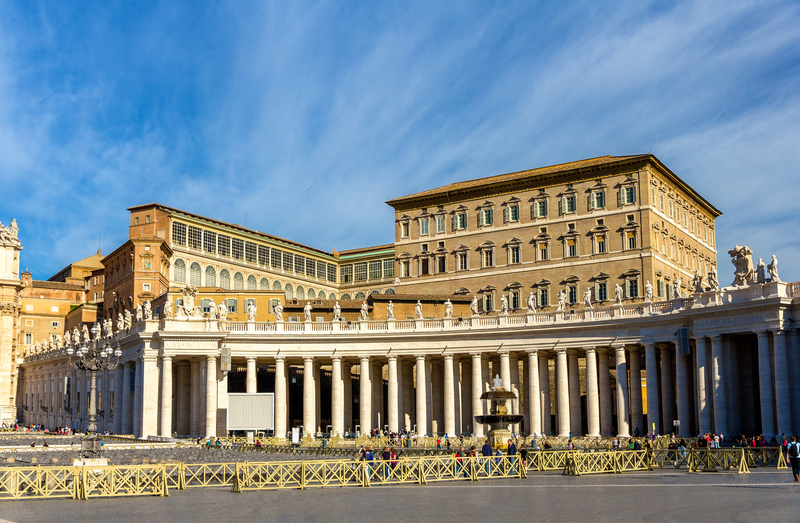 The Apostolic Palace is a complex building comprising of several Papal Apartments, the Vatican Museums, some of the Catholic Church’s government offices, the Vatican Library, and a number of both private and public chapels among other buildings. 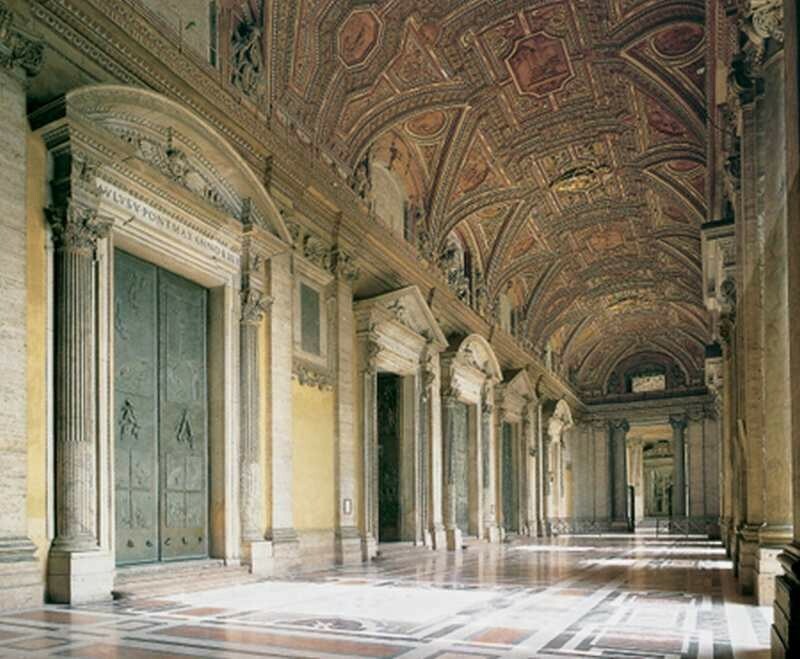 Generally, there are over 1000 rooms within the Apostolic Palace. The palace is not merely the pope’s residence. 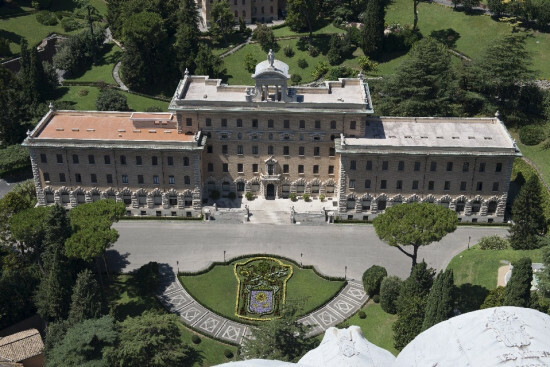 It is also houses offices that are used for other administrative functions of the Holy See. The renowned Sistine Chapel and the Raphael’s Rooms are a part of the Apostolic Palace. The Vatican City State has never had independent armed forces, but it has always had a de facto military provided by the armed forces of the Holy See: the Pontifical Swiss Guard, the Noble Guard, the Palatine Guard, and the Papal Gendarmerie Corps. The Pontifical Military Corps, except for the Swiss Guard, was disbanded by will of Pope Paul VI, as expressed in a letter of September 14, 1970. The Gendarme Corps of Vatican City State is responsible for all police activities and answers to the State Authority. It is a civil, not a military, organization.